Accessible within a few hours via international airports in Atlanta, Nashville and Chattanooga, and a few hours drive from major cities in the South. Main Office Open 8:30 AM – 9 PM daily. All visitors are welcome including families. Two wholesome vegetarian meals are served daily at the Isha Institute: 10 AM (brunch) and 7 PM (dinner). Those visiting the Abode are welcome to make a donation and join for the meals. Abode of Yoga is open from 8 AM – 8 PM daily. Anyone can benefit from the energies of the Abode regardless of race, religion, age or physical ability. Upon entering, one can simply sit silently with palms facing upward to connect with the energy of the Abode. Visitors to the Abode may offer water to the linga and make contact with it as a way to connect more deeply with the powerful energies the form radiates. This process is open to anyone for free. Periodic cleansing of the energy body wards off negativity and provides one with a protective aura supporting physical health and mental wellbeing. Klesha Nashana Kriya includes a powerful process with neem leaves, which are a great cleanser and energizer of the system. This process is available to those of all ages. Ayush Kriya supports overall health and wellbeing. The process includes Klesha Nashana Kriya, a cleansing process for the energy body, and Loha Arpanam, an offering of precious metal in your choice of gold, silver, or copper. 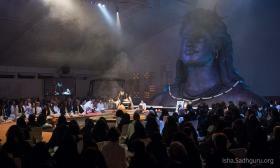 Ayush Kriya is often conducted to celebrate a birthday, wedding anniversary, or other significant milestone in the Grace of Adiyogi. Vijaya Arpanam supports new endeavors, existing businesses and careers. The process involves an elaborate offering of the five elements to the Abode. As part of the process, you receive a consecrated, precious metal coin in your choice of gold, silver or copper bearing the image of Adiyogi. The coin serves as a reminder of your offering and a connection with the Abode. On both full moon and new moon days, we are performing the Vijaya Arpanam process on behalf of those who are unable to visit the Abode in person. Once the process is complete, you will receive your coin and a prasadam package by mail. This age-old tradition introduces young children into the world of knowledge and learning. It is a supportive process for children enrolling in school or for the start of a new school year. 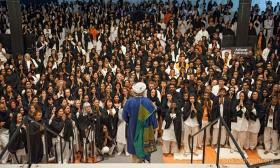 This ceremony enhances a child’s health, longevity, strength, and vitality. Anna Prasanam supports the transition of a baby from mother’s milk to solid foods. It is a celebratory occasion where family members and friends can participate in the first feeding of your child. Receive offerings by mail throughout the year: You can be in touch with the Grace of Adi Yogi no matter where you live by receiving prasadam from the aarti offered to Adi Yogi on full moon days. Shipped to your home monthly, the Pournami Pooja prasadam package includes: a copper pot of vibhuti, prasadam, a neem leaf, a flower that you may keep with you in your pocket or purse and an Adi Yogi sutra. 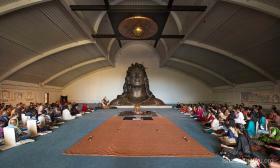 A larger celebration in honor of your special occasion can be arranged for your family, friends, or the whole ashram. Group celebrations can include annadhanam-a special meal and/or prasadam (sweet) offered at the Abode and served in the ashram dining. There is a whole system of yoga called Bhuta Shuddhi, which means “purification of the elements.” The Bhuta Shuddhi process provides a unique opportunity for everyone to benefit from this deep yogic science, which otherwise requires intense sadhana (spiritual practices). One can continue this process at home on a daily basis. The fee for Bhuta Shuddhi class is $111, which includes your kit for daily practice. At the Abode, visitors can learn a very powerful system of yoga called Yoga Namaskar, and offer it by practicing within the Abode to become more receptive to the energies there. It has all-around benefits for the entire body, including activating the lumbar region of the spine in a tremendous way to regenerate and protect the spine as one ages. Yoga Namaskar is a very simple and complete process by itself, which visitors can continue to practice when they return home. There is no fee to learn Yoga Namaskar. As life is just energy manifested itself in various forms, a whole science of consecration is also about using these life energies and the manifested forms which could be of immense benefit and serve human well-being on various dimensions. 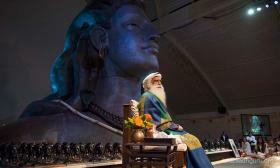 Sadhguru established the Abode of Yoga through the potent and ancient process of consecration over the process of three days in September of 2015. 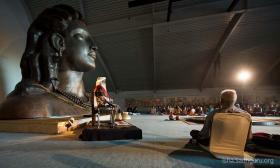 The Linga is one such form and the science of manifesting energy in the Linga form is an ancient science. These places were created as energy centers where people could go, recharge themselves, reverberate with the energy and come out. This whole science is known as the science of consecration. You consecrate a certain space with a certain reverberation where people can go and benefit from that. For different purposes they created different types of spaces where you need not go and appeal or pray for anything. You just go sit there, imbibe that and come. This is a kind of technology. Consecration is a live process. If you transform mud into food, we call this agriculture. If you make food into flesh and bone, we call this digestion. If you make flesh into mud, we call this cremation. Similarly, if you can make this flesh, or even a stone or an empty space into a divine possibility, that is called consecration. Today, modern science is telling you that everything is the same energy manifesting in a million different ways. What you call divine, what you call a stone, what you call a man, a woman, or a demon, are all the same energy functioning in different ways. For example, the same electricity becomes light, sound, heat, and so many other things depending upon the technology used. Similarly, if you have the necessary technology, you can make the physical space around you into a divine exuberance – this is the phenomenon of consecration. Over 15,000 years ago, Adi Yogi guided seven determined seekers, known as the saptarishis – the “seven sages,” in imparting the science of yoga. He taught them the very nature and mechanics of the human system, and illustrated seven different ways to approach this great knowledge. 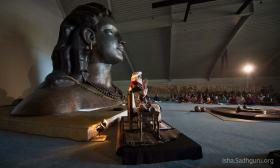 Agastya Muni, one of the seven saptarishis, went to southern India to carry Adi Yogi’s message. One of the methods that Agastya Muni used to facilitate the transcendence of human nature to the peak of consciousness was “consecration”. He consecrated every human habitation south of the Deccan Plateau, ensuring the space was available for current and future generations. In ancient India, consecrated spaces existed to enclose a part of the world within a cocoon of grace. Access to these consecrated spaces gave people balance and strength. It provided a place to disengage from the vacillations of the material world and to ground oneself in deeper dimensions. Consecrated spaces laid the foundation for individual growth, inner and material wellbeing, and enabled people to live peacefully, joyfully, and harmoniously. Over time the understanding of the value of consecrated spaces eroded as societies slowly forgot their purpose and later became spaces of worship and ritual only. 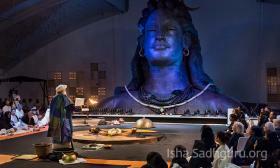 It is Sadhguru’s vision to create consecrated spaces all over the world in acknowledgement of Adi Yogi, not only in gratitude for the tremendous contribution he has made to human consciousness, but as a way for everyone to transcend their limitations and experience the possibility of yoga. 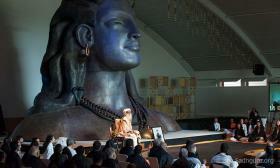 A visually striking 30,000 square foot space, the Abode is a two-level structure housing a 21-foot statue depicting the meditative image of the Adi Yogi alongside a consecrated linga. A breathtaking 21’ metal artwork depicts the meditative image of Adi Yogi, the first yogi, who offered the methods and science of Yoga as practiced by millions around the world today. Every form and shape has its own vibrance and quality about it. This ellipsoid or linga can be energized in various ways to bring different types of wellbeing to humanity. At the Abode, the linga is submerged in water and all visitors have the opportunity to touch the form and connect with the energy that it radiates. The most fundamental aspect of yoga is Bhuta Shuddhi – that means cleansing of the five elements that make up our physical existence and the planet we live on: Earth, Water, Wind, Fire and Space. Visitors to the Abode can make use of this deeply purifying science for their well-being. At the Abode, experience the one-of-a-kind artisan copper-work that depicts the five elements and fundamental mantras, which surround the energy form. View exquisite and unique paintings depicting stories from the life of Adi Yogi — one as a man, another as a yogi, an ascetic and a Guru. Spanning the length of the walls inside the Abode, these stories offer inspiration for all and celebrate the significance of the Adi Yogi. 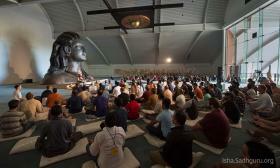 Experiencing the benefits of the Abode does not require any prayer or worship. 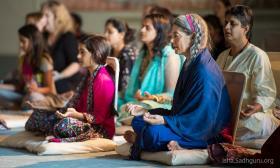 Visitors can connect with the energies of the space by simply sitting, doing yogic practices, or through several offerings and processes. "I closed my eyes and immediately felt myself radiating with a different kind of energy. 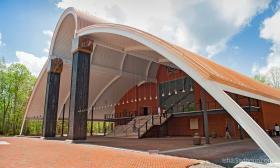 The beauty and aesthetics of the space is remarkable too!" "This is an amazing space. I was never into religion but when I went there they were patiently explained to me how it was not religious but there was a scientific explanation of why everything is created and maintained the way it is. I felt very calm and meditative in this space."